You are looking at an extremely rare,1789 Catherine II Medal for Bravery. 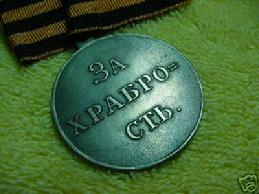 This medal was issued by Catherine the Great for capture of the Swedish stronghold in the Battle of 1789. You can see the information about this medal from Chepurnov Catalog, item #109 or if you click on the thumbnail, you will see the picture of the page from the Catalog.